Have you ever wondered how accurate "Grey's Anatomy" is? I was pretty sure not all medical students are so attractive and falling into bed with each other and their bosses quite so frequently, but I thought it did a decent job of showing the long hours, screw-ups and doubt that interns and residents go through while learning the hard task of being a doctor. However after reading Dr. Jauhar's memoir, it seems that as usual, Hollywood has lightened things up quite a bit. Sandeep is working on his Ph.D. in physics when he decides his prospective career isn't going to be enough for him, and he wants to be a doctor after all, inspired partly by having previously dated a girl with Lupus. While he finishes up his physics research, he takes premed prerequisites, and gets into Washington University in St. Louis. Since he already has that degree under his belt, he's able to complete medical school in 4 years instead of 5 (although that still puts him at the ancient age of 29- oh no! - as his father points out.) And then he goes to New York to begin his internship which is at the same hospital where his older brother also works as a doctor. There he experiences what I hope is the hardest year of his life. The cases and patients are fascinating (if occasionally gross) and he's brutally honest about the doubt, exhaustion, depression, errors, and flaws he experiences in the process. He does think about quitting, but sticks it out. He has a hard time deciding on a specialty (and he has less time to make this decision because of the 4-year fast-tracking). And he meets a girl, Sonia, also training to be a doctor. He loves her but isn't sure that a 2-doctor marriage can work out well. 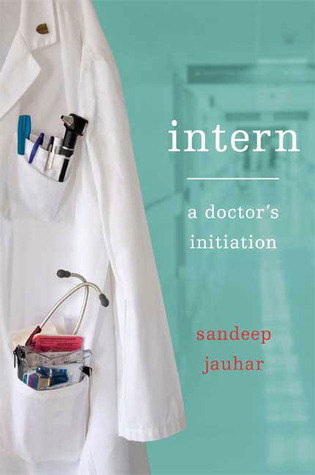 Despite many misgivings and questions and uncomfortable situations and some questionable medical issues, Sandeep gets through the year (and the first year of residency, as the book really covers two years not just one). It's a pretty fast read, he's a good writer who can mostly make medical jargon plain to regular readers (and where he doesn't, it's moot), and his experiences made me feel like my own career missteps in my 20s were pretty minor in comparison. It was an interesting tale of a career path I am very glad to only watch from the sidelines. I bought this book used from my local independant bookstore. I haven't heard of this book but it sounds like an interesting memoir. I will definitely have to look for it the next time I'm at the library!